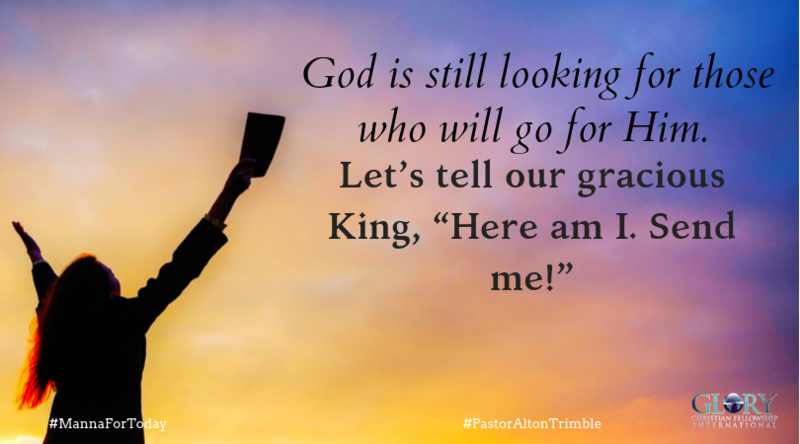 God is still looking for those who will go for Him. Will you – like Isaiah – acknowledge God’s call to go by declaring you are willing to go today? You might say, “Well, where do I go?” Most of us think that God might want us on the back side of some third world country if we say, “I’ll go.” For some that is their calling but, for the majority, it’s not at all. God wants most of us to just go to work, school, business, recreation, home or the store for Him. So when you go to get bread from the store remember that you have brought the “Bread of Life” with you and someone may need a loaf. Thank you for this word!!! A reminder that wherever I go, I’m on assignment. God can use me everywhere I go, even the grocery store, if I allow him.